The region of Lomellina and the entire province of Vigevano are beautiful lands which are characterized not only by the abundance of natural resources, but also for their significant history. Almost all the centres of Lomellina preserve sacred buildings and castles, symbols of the alternation of secular and religious power that marked the history of this land. In fact, if one side, the Romanesque church of S. Pietro a Robbio or the Sanctuary of Madonna della Bozzola are just some of the religious monuments scattered throughout the territory, on the other, Castles of Scaldasole, of Cozzo and of Sartirana are a portion of its several historical monuments. The latter dates back to the XIV century and is the biggest one of Lomellina. At present its halls host the Museum of Contemporary Silver Handiwork, Modern Goldsmith, Textile Arts and Art Graphic. Full of artistic and architectural elements, Lomello is a high-medieval nucleus where, still today, tourists can see the majestic castle, but most of all the Baptistery of S. Giovanni ad Fontes and the Cathedral of S. Maria Maggiore, which date back respectively to the V and X centuries. 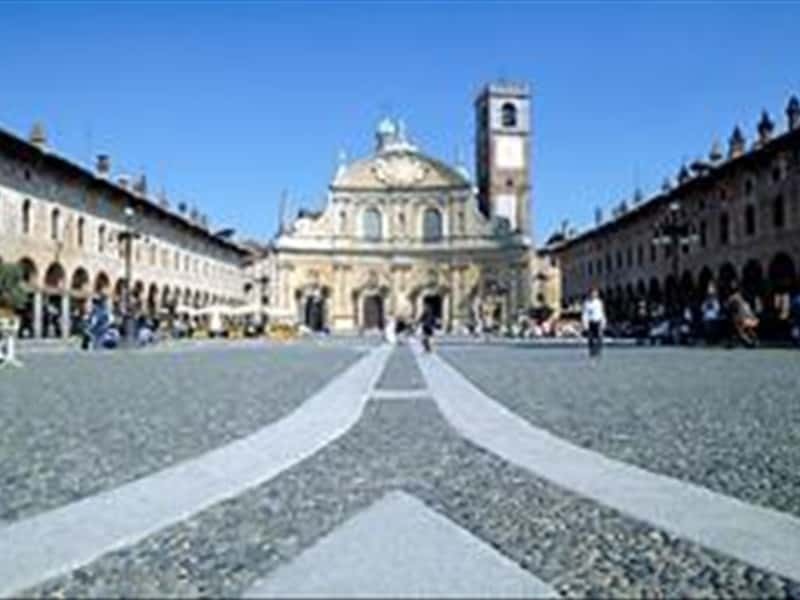 Natural capital of the entire territory is Vigevano with its spectacular piazza Ducale, built during the Renaissance. Realized thanks to the indications of Leonardo da Vinci and of Bramante, and designed as extension of the Sforza Castle, two centuries later it was modified by the Bishop Lobkowitz who transformed it in the Cathedral's churchyard, famous for the treasure of the cathedral accumulated in years, whose first donations were given by Francesco II Sforza. But, apart from the Castle, the Cathedral and the Ducal Palace, Vigevano preserves a homogeneous urbanistic plan, despite the alternation of different eras and styles: in particular, late Baroque left everywhere its traces on local architecture. This destination web page has been visited 64,640 times.